Natalie Amos was named both All-Region and All-Defensive Team by the NWAC Coaches. photo by Rick May. Coming in with a 7-4 record which has Edmonds Community College off to their hottest start in years, the Bellevue College Bulldogs appeared to be on their way to their eleventh loss of the year. However, a slowed-down tempo that produced less than ten points per team for all but one quarter for Bellevue was enough to twist their fate in a 49-37 win at Edmonds tonight. The Tritons led 23-19 after the first half as neither team could find the net. Edmonds shot a lowly 8-for-29 in the first half but Bellevue could do no better at a 21% clip, shooting 5-for-24. The low scoring continued for Edmonds in the third quarter as the Tritons managed only eight total attempts in the quarter. 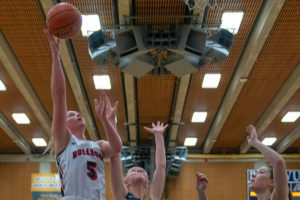 Bellevue’s Amanda Luckett had a huge role in the decisive third quarter, pulling down five rebounds which limited Edmonds’ opportunities and also sank 4-of-5 from the field leading BC to a huge 22-point quarter which swung all the momentum to the visiting Bulldogs’ side. Both teams then went back to their cold-shooting start as both Bellevue and Edmonds shot at the 20% range again as they did in the first half. With Edmonds unable to capitalize on BC’s lone hot quarter in the third, Bellevue sailed to victory on Edmonds’ home floor. Luckett’s 10 points and game-high 10 rebounds were complemented by fellow freshman Natalie Amos, who played every minute in the game and led BC with 16 points and had nine rebounds. Bellevue returns home this Saturday January 26 for a 4:00 p.m. tipoff against Olympic.